This book is a direct outgrowth of classes that the authors gave over a period of three decades to a university audience taking a Mineral Beneficiation course as a major that included coal processing and utilization. It is designed to be used as a student’s (or layman’s) first introduction to coal processing and utilization, motivating the concepts before illustrating them by means of concrete situations. 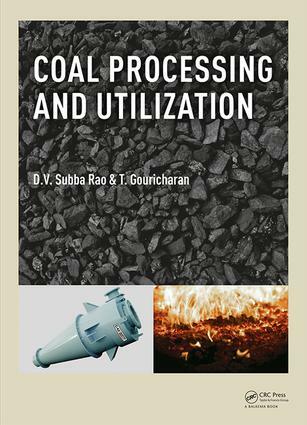 As such, this book gives an integrated overview of coal processing and utilization along with clean coal technology, presenting all the basic principles, theory and practice in a systematic way. Every topic covered is dealt with in a self-explanatory manner so that any new reader may find this book interesting and easy to understand. reader to understand the concepts effectively without needing to consult additional literature. Problems are introduced not so much to be solved as to be tackled. Some of them are included to lay the ground work for the subsequent theory and will help the readers in teaching, research and operating plants. Overall, this book will be of interest to professionals and engineers in the fields of energy, mining, mineral, metallurgical and geological engineering, as well as to engineering geologists and earth sciences professionals. "I am delighted that the book "Coal Processing and Utilization" has been published, and I express my sincere thanks to both authors for their untiring endeavor in writing such a vital and timely book. The topic is presented in a clear manner, and the unfolding concept of coal preparation and its utility is explained well through calculations and a problem-solving approach. I firmly believe that this book will be highly useful for both graduate and postgraduate engineering students as well as practicing coal preparation engineers in the industry. I look forward to more publications of this kind in the near future." Om Prakash, General Manager - Engineering, Metso India Pvt Ltd.
"The beauty of the book that it is not bound by any boundaries of syllabus which is normally a part of text book. The use of simple English, small sentences, simple lucid style for proper understanding of concepts attracts any reader. This freelance style keeps the reader engrossed with the book, be it be a diploma - degree graduate student, fresher and professional executive. The integrated picture of coal characterization, processing and utilization has been portrayed beautifully meeting the objectives set in. The problems at end of the chapters with Indian context is noteworthy. The chapters on coal washing efficiency, carbonization, gasification, liquification and carbon capture - storage are exemplary. The book will be an asset to diploma, graduate and post graduate students, professionals of fuel, mineral, mining, chemical engineering, coal washeries and thermal - metallurgical plants." Dr. B.P. Ravi, Professor at the Department of Mineral Processing, VSKU - PG Centre, India. Dr. D.V. Subba Rao is retired associate professor and head of the department of Mineral Beneficiation at S. D. S. Autonomous College, (India). He has 32 years of experience at S. D. S. Autonomous College and presently serves as a guest faculty in the department of Mining Engineering at GIET, India. He has published multiple books on mineral beneficiation and has been member and chairman of academic bodies such as BOS in Mineral Beneficiation, BOS in Materials Handling and BOS in Applied Chemistry as well as the academic council and governing body of S. D. S. Autonomous College. Dr. T. Gouricharan is senior principal scientist and head coal preparation division ath the CSIR (Central Institutde of Mining & Fuel Research), India. He has a Ph.D in Mineral Processing from VSK University, Bellary (India), and has 26 years of experience in the department of Coal Preparation at CSIR, and 4 years of experience as a professor and faculty member at the Academy council of Scientific Industrial Research. Dr. Gouricharan has published more than 80 papers in Indian and international journals and national and international conferences.